Sothebys, London, 11 November 1993, lot.15 as: ‘A Lady, said to be from the Hay family’; Karin Henninger-Tavcar, 1994; Private Collection, Germany. Converted gold bracelet clasp frame . The sitter in this work has traditionally been identified as a lady of the Hay family, although which family named Hay remains unclear. In her 1964 monograph, Daphne Foskett lists a portrait of ‘James Hay, 13th Earl of Erroll’, although this must be incorrect as the 13th Earl of Erroll died in 1717. A more plausible sitter would be James Hay, 15th Earl of Erroll (1726-78) who married twice and is believed to have had three sons and ten daughters. 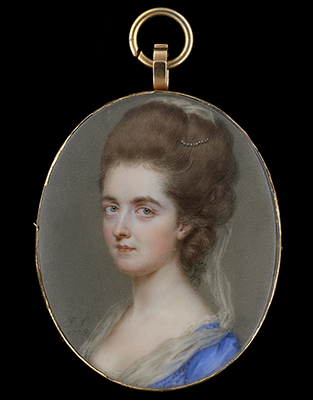 A potential identity for this sitter could therefore be Lady Mary Hay, daughter of the above from his first marriage to Rebecca Lockhart, who would have been aged twenty-four years of age when this work was painted.